Is Mirror Pool after Rebound upkeep possible? How do Mirrorpool and Mutavault interact? 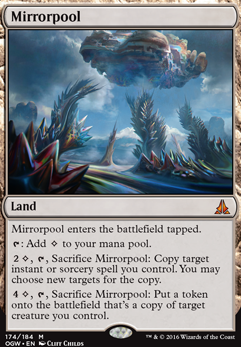 Will using Mirrorpool to copy Titania, Protector of Argoth allow me to put Mirrorpool back on the battlefield with Titania's triggered ability? Thanks for the input! I'll continue looking into using Emeria, it seems to have a super high ceiling with all the strong ETBs Trostani decks tend to enjoy. 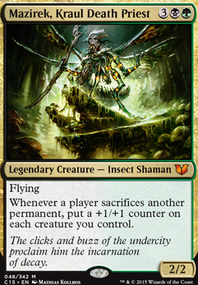 The manabase I'm currently testing runs 8 basic Plains and 9 basic Forests, and all the basic land-type duals I can reasonably use. 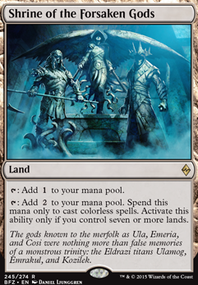 Finding a good mix between enough basics for Emeria while having colorless mana for Mirrorpool has been an interesting deckbuilding experience so far! If things work out I'll update the online list, as I tend to reserve it for cards I've used for a while. On that note, how much of a stretch would it be do use Knight of the Reliquary to take advantage of the amount of basics? I've been trying it out alongside things like Glacial Chasm and Ancient Tomb and so far it's been good. Tireless Tracker has also put in enough work for me that I slotted it in even without delving to hard into a fetch-heavy manabase. Lastly, how has Seance been for you? It's been an absolute house alongside Trostani and Seedborn Muse , but outside of that I find it fairly average. Your deck also seems light on basic lands as Blood Moon , Magus of the Moon interrupts you hard(not to mention back to basics), If you ever find yourself screwed by those effects id take out non-fetchable dual lands and non-cycle lands such as Mirrorpool (strip mine is fine) and actually play blood moon to disrupt and turn it into an advantage. So to address omitting the praetors I think all I have to say is CMC cost. They cost a tun each! 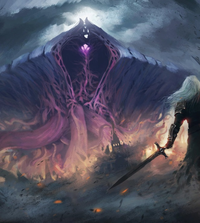 I am running the Phyrexian theme but from the angle of purely embodying the ideals of Phyrexia without actually running infect or a tun of Phyrexian creatures...etc. 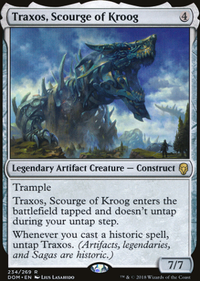 I see Atraxa as the next generation of Phyrexia so no need to include her parents. My build is to try to be as fast as we can (without breaking the bank ofc); lean and mean. 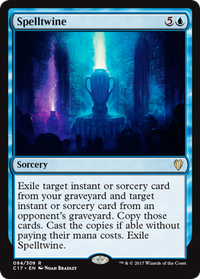 I do make some acceptions for cards that basically say I win Tooth and Nail (or at least 1 turn from winning) but generally try to stick around the 5CMC as my upper limit for good support cards. She ramps well enough to get me to that 9 mana mark with a spare 3 mana left over occasionally for me to copy Tooth and Nail with Mirrorpool and if no one can stop this...we win. By this point couple of the guys at the table usually aren't far off winning either, so I can't afford to have 4 old-timers accompany her. I prefer to have them watch from the sidelines and admire their handy work as she rages and bathes in the lifeforce of her enemies. I'm trying to fit alot into her to be quite versatile without loosing what she's meant to be (A Voltron while we Control till we can piece together our Combos); and having her "makers" in the deck will simply slow her down or I'd have to rework the deck completely to build it around them instead, which might be interesting, but not for this current build. + My group has a ban on the 2 best ones anyways :) Vorinclex, Voice of Hunger & Jin-Gitaxias, Core Augur Those would probably be the only ones I would run as I don't run enough creatures to make use of neither Elesh Norn, Grand Cenobite nor Sheoldred, Whispering One. They each have very individual abilities and don't crossover unless you're running a creature-counter build and even then it would be a tight squeeze for 2, but all 4 would be a little too much on the casual side for my current liking. 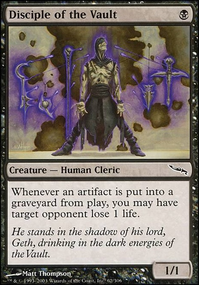 I'd probably definitely need to run Cabal Coffers combo (Cabal Coffers + Urborg, Tomb of Yawgmoth) to have access to the amount of mana I would need to get them out as early as I'd like. Then to fit that in I'd need to run more cards to grab both those cards like Expedition Map Tempt with Discovery Crop Rotation etc. 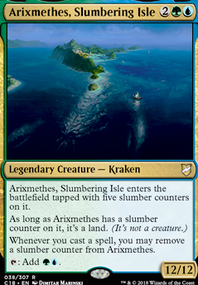 in addition to possibly running Weathered Wayfarer to try to have Coffers combo out consistently + changing the land base to include more basics so we can add more green ramp to make use of Coffers when we activate it. With all of that...probably most of the counter spells would be replaced changing the deck entirely. Thanks again for checking out the build. Any card recommendations or changes you'd make?